3 p.m. 8.25.18: While the Māʻalaea and Kāʻanapali fires have been fully contained, the Lahainaluna to Launiupoko fire is 80% contained. At the present time, Maui County’s fire personnel is mopping up the Makai, Lahainaluna, Launiupoko flanks. The State DLNR Division of Forestry and Wildlife is working on the mauka flank in the Kuia area. According to Battalion Chief Michael Werner, the initial damage assessment reports the following were impacted: 6 structures near Lahainaluna; 15 structures near Launiupoko area (including Punakea Loop, Hokiokio, Kau’a’ula Valley); 1 baseyard with heavy equipment; and 30 vehicles. 2:17 p.m. 8.24.18: A total of seven homes were damaged in the West Maui fire and sustained anywhere from moderate damage to being completely destroyed. The affected homes were in the area south of Hōkiokio Place . The Maui Fire Department has confirmed that the gas station and schools are in tact despite rumors otherwise. 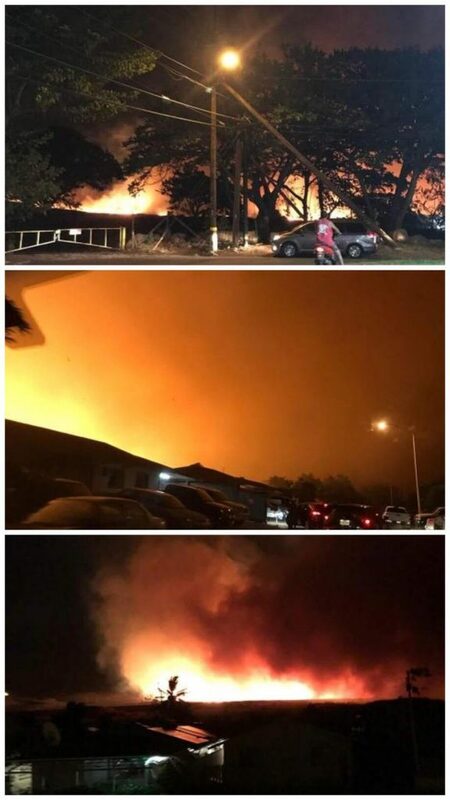 There were a total of three fires in West Maui over the Last 24 hours. 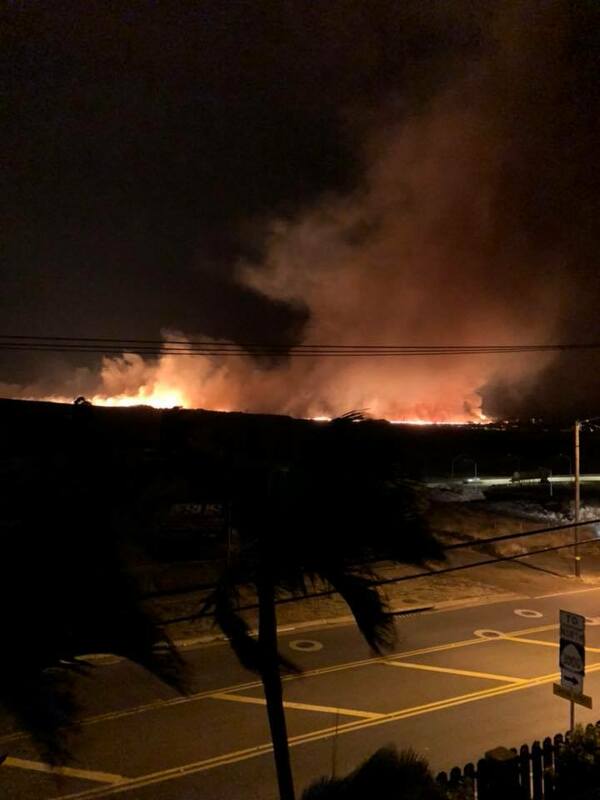 The first occurred at around 9:44 p.m. A total of 30 acres were charred in last night’s Māʻalaea fire, which is now 100% contained. 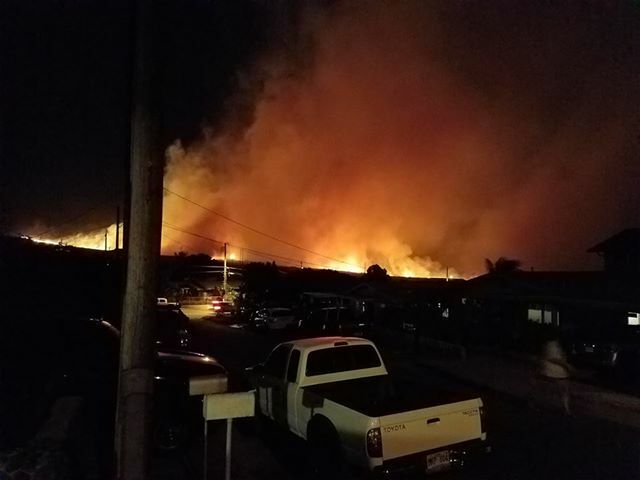 At around 1 a.m. the Launiupoko/Kauaula fire started and has since grown to about 1500 acres in size and is 40% contained. The areas around area homes is now contained, but the fire was headed toward the mountain area at last report. 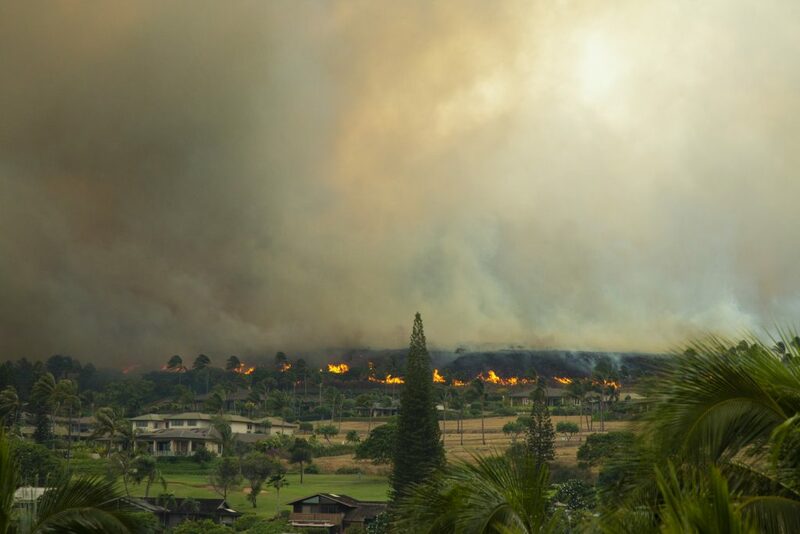 At 7:20 a.m. a fire in Kāʻanapali started and spread to 800 acres. That fire is now 100% contained. 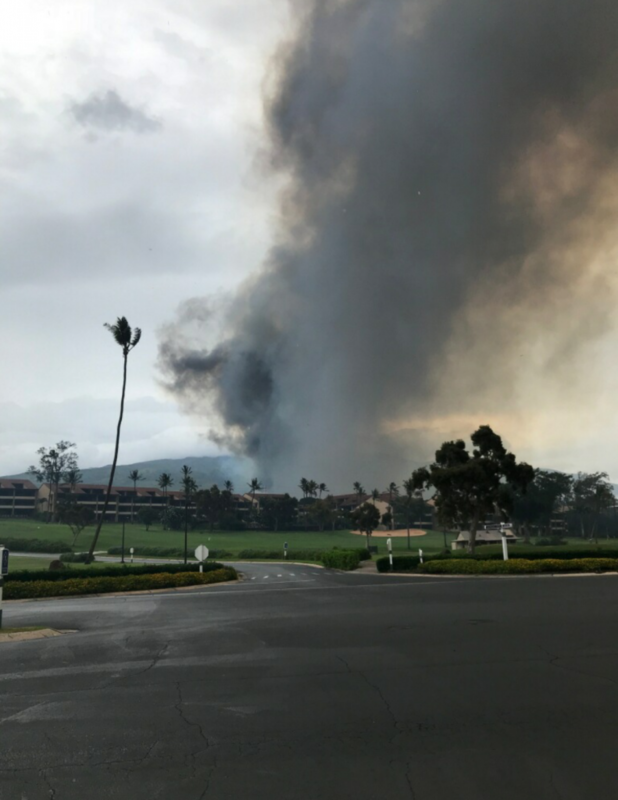 Fire officials say the Launiupoko and Kāʻanapali fires started as separate events, but due to intense conditions joined at one point. County officials say winds of 48 mph prevented the department from utilizing helicopter water drops. At least one female was injured in the Launiupoko fire and was transported to Oahu for treatment of burns to her hands and legs. 1:19 p.m. 8.24.18: Kai Hele Kū Street in Lahaina remains closed due to fire response efforts. 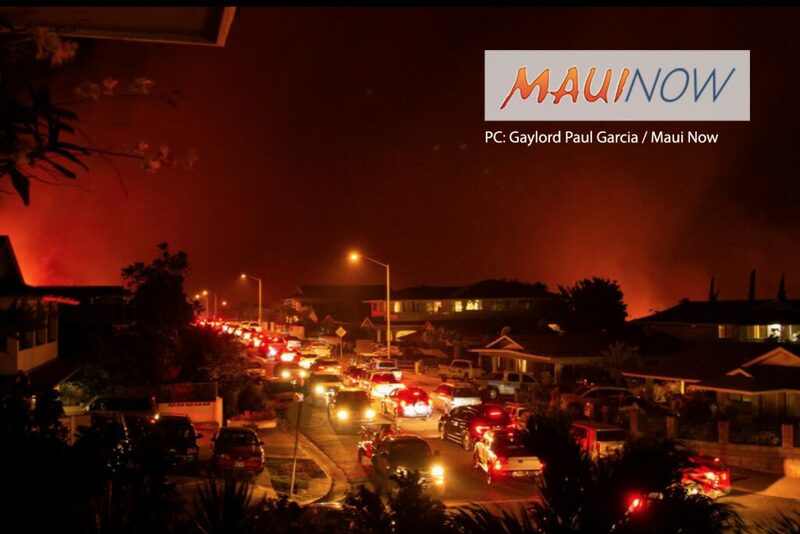 The Maui Fire Dept will make the determination on evacuations and when they are to be lifted. 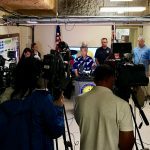 The County will push out an alert on all Maui County platforms and will notify us as well. Right now, they are not ready to let evacuees return. They have not yet released details about what homes were spared or suffered damage. This incident remains under active response. 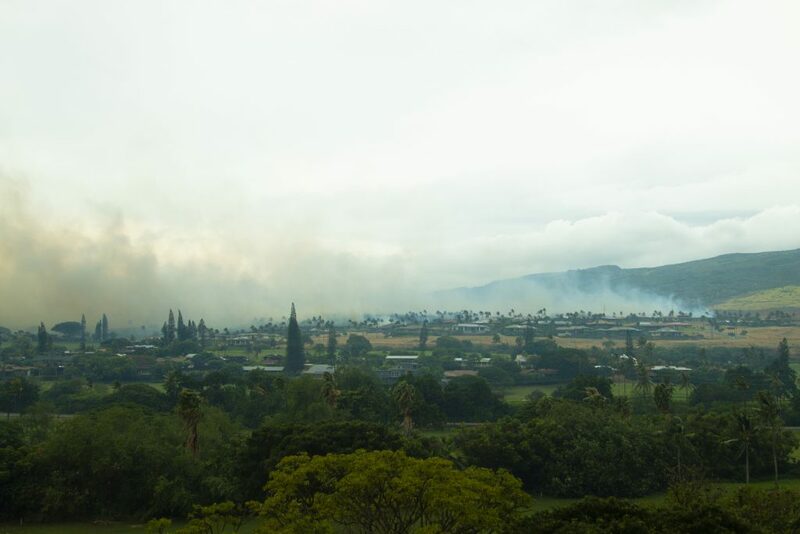 10:43 a.m. 8.24.18: Fire crews continue to battle two separate fires–one that started in Kauaula Valley, and another that was reported this morning in the hills above Kāʻanapali. 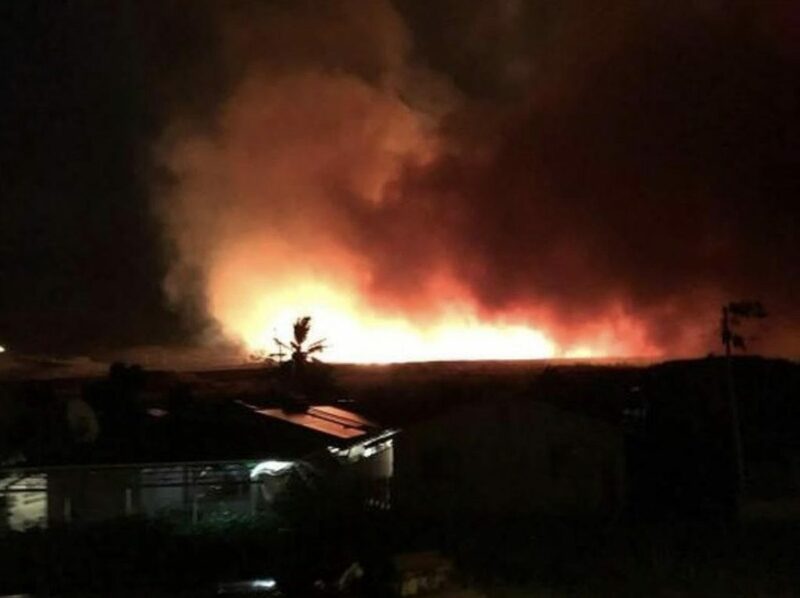 Maui Mayor Alan Arakawa said the strong winds associated with Hurricane Lane were hampering firefighting operations at the Kauaula fire which had spread to at least 300 acres by around daybreak. Part of the fire had come close to the bypass area and county officials were still uncertain about the amount of property damage sustained. Mayor Arakawa that the strong winds have prevented crews from utilizing the Department’s helicopter for water drops. Last night, crews also battled a fire in the hills above Māʻalaea in the West Maui Mountains. 10:06 a.m. 8.24.18: County officials have confirmed that there were no explosions at any gas stations and there are no direct impacts on Lahainaluna School. The question was in response to inquiries about heavy black smoke and fears of the Kauaula fire’s impact on the nearby gas station and school facilities. Also, just reiterating, the Honoapiʻilani Highway is OPEN in both directions as of 9:30 a.m.
9:30 a.m. 8.24.18: The Honoapiʻilani Highway is now OPEN in both directions. 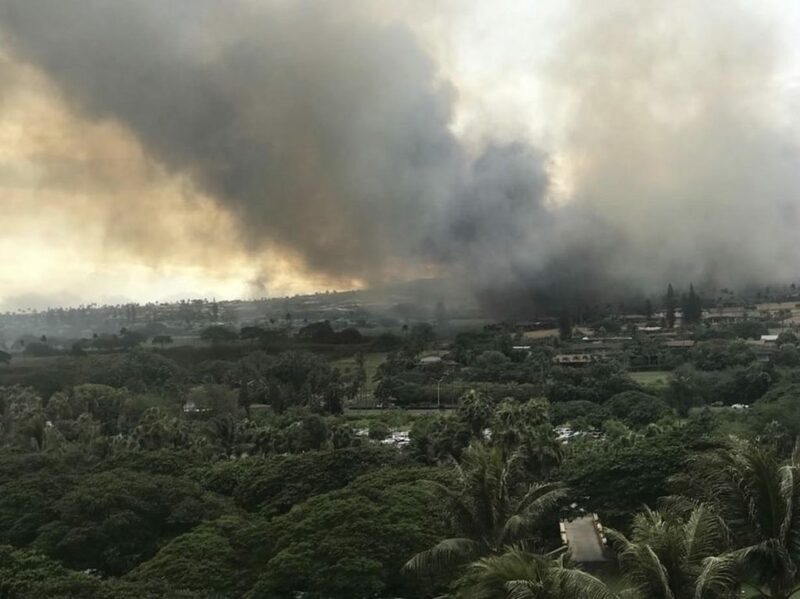 It was closed earlier this morning as fire crews battle a large fire in Kauaula Valley, and a separate fire in the hillside above Kāʻanapali. The fire also forced the closure of the storm evacuation shelter at Lahaina Intermediate. Evacuees were transferred to Lahaina Civic Center. At this time, it is estimated that there are 300 evacuees inside the civic center with another 200 outside on the property. 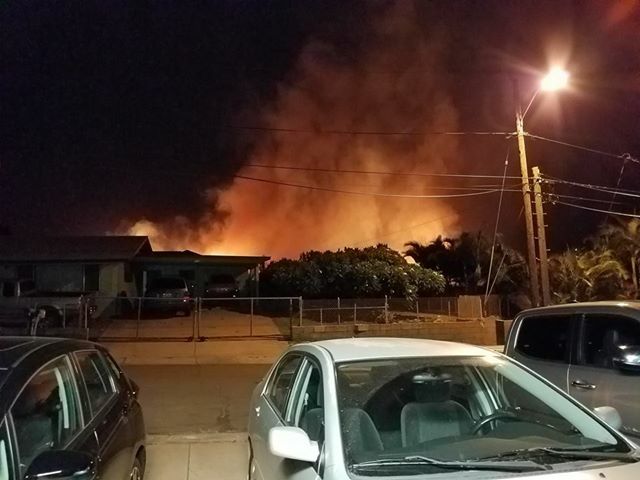 Some time after the first fire began, a second fire popped up in the Kāʻanapali area causing Maui police to evacuate Kāʻanapali Hillside homes. It is unknown at this time how many homes were evacuated from the second brush fire. One person has been injured from the fire, a female with burns on her arms and legs was medivaced to Oahu early this morning. There is no other information on the victim at this time. Because of the fires, the Department of Water Supply has asked that all county and private water customers in Lahaina, Launiupoko and Kāʻanapali conserve water. This will help ensure fire fighters have enough water to battle the two brush fires. 8:52 a.m. 8.24.18: Maui fire crews are now battling two brush fires. There is a separate fire burning in the Kāʻanapali area. The two fires are not connected to each other and county authorities say they do not know how either fire started or if they are storm related. Police have shut down both the Honoapiʻilani Hwy and Kahekili Highway, blocking access into and out of West Maui until further notice. Overnight, fire crews responded to a quick moving brush fire in West Maui that has since grown to 300 acres. Maui Communications Director Rod Antone says it’s unclear at this time if it is storm related. One female was flown to Oʻahu for treatment of burns to her hands and legs. There’s also property damage, but authorities do not know at this time to what extent. The County also advises motorists that in addition to the Honoapiʻilani Hwy closure (from Māʻalaea to Shaw Street in Lahaina), the Kahekili Highway is now completely closed from Nākālele to Waiheʻe. 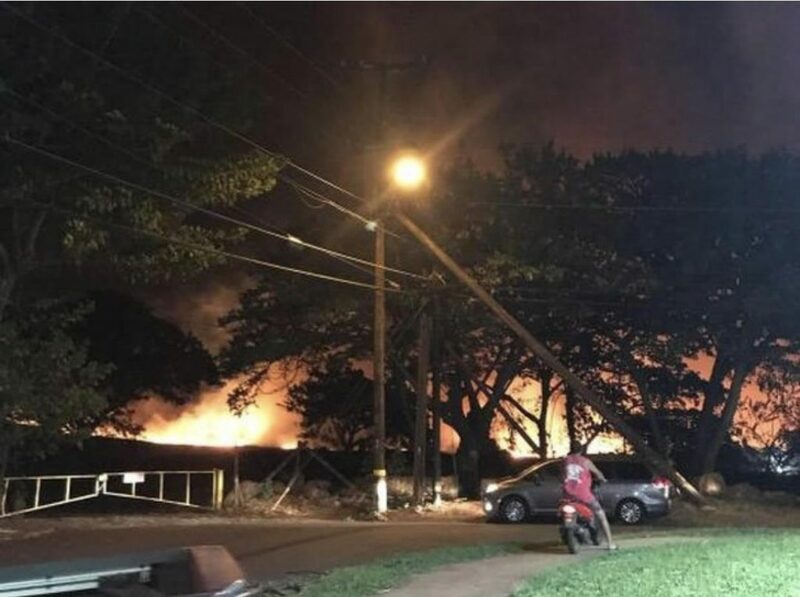 Update: 5:51 a.m. 8.24.18: Fire officials have reported that the fire has jumped Honoapiʻilani Highway near Dickenson Street and is approaching Aloha Gas Station. Please note that Honoapiʻilani Highway is now closed in BOTH directions due to the large brushfire. Initially it was closed from Māʻalaea to Shaw Street in Lahaina for westbound traffic only, however it is now closed in both directions. Kahekili Highway is closed on the Waiheʻe side and is only passable one way, Kapalua to Waiheʻe but, due to the weather, it is not advisable. We have learned that the fire in Kauaula Valley has since grown to 300 acres, according to Maui Communications Director Rod Antone. One female was flown to Oahu for treatment of burns to her hands and legs. Antone says the Honoapiʻilani Hwy is closed for Lahaina-bound traffic; but motorists in Lahaina are being allowed to leave towards Central Maui at this time. Maui fire crews are responding to an active brush fire in Kauaula Valley in West Maui. The fire has resulted road closures and evacuations. 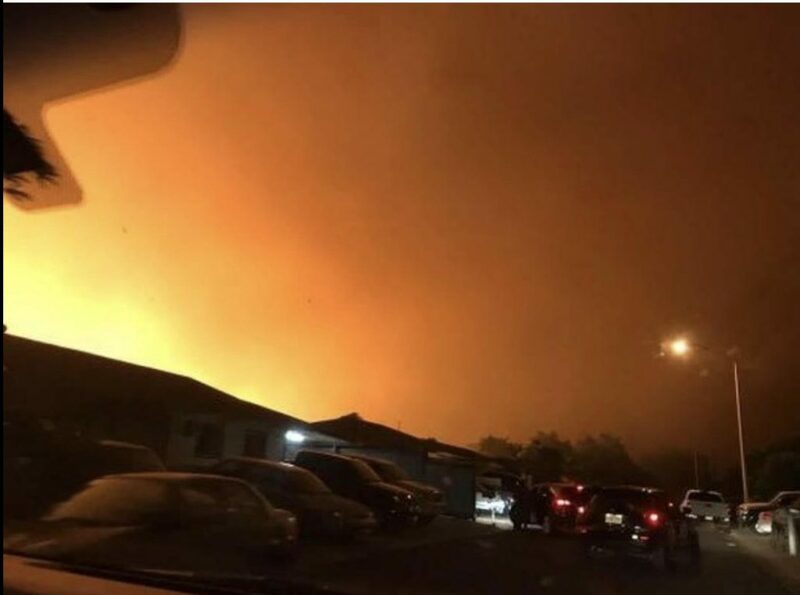 As a result of rapidly spreading fire and, out of precaution, the Emergency Operating Center and Red Cross are in the process of evacuating people presently in the emergency shelter at Lahaina Intermediate School to Lahaina Civic Center. At last count there were 26 evacuees in the Lahaina Intermediate shelter. 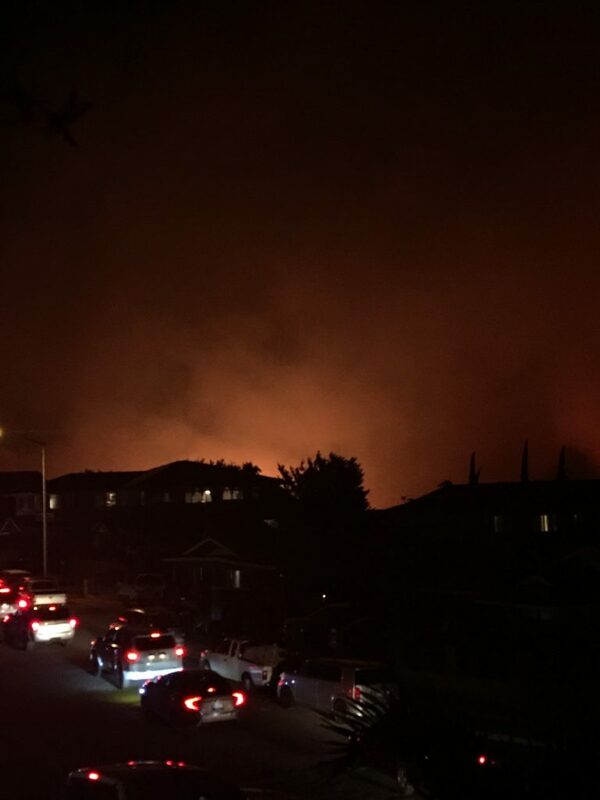 County officials say the incident has forced an evacuation of approximately 100 homes in the Puamana area. Maui police have closed Lahaina-bound traffic on the Kahekili Highway due to an ongoing brush fire in Kauaula Valley. 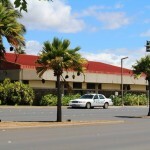 The Honoapiʻilani Highway (the main artery into and out of West Maui) is also closed at Carl’s Junior in Māʻalaea and Shaw Street in Lahaina. Reports have been received that Hawaiian Tel customers are unable to make or receive phone calls into or out of the Lahaina area at this time. Cell phone service is also reported to be sporadic. The fire was initially reported at around 1 a.m. on Friday, Aug. 24, 2018 and quickly spread. Initial estimates placed the fire at 3 to 4 acres. At the present time, 10 fire companies, tankers from both the Fire and Public Works Departments, and one battalion chief are at the scene. On Friday August 24, 2018 at about 1 a.m. Emergency personnel began responding to reports of a brush fire in the area of Kauaula Valley in Lahaina. The fire, which is estimated to be 3 to 4 acres in size has begun to spread and residents in the area are being evacuated. Honoapiʻilani Highway is closed at Carl’s Junior in Māʻalaea and Shaw Street in Lahaina. Motorists should avoid the area.